Shatranj Ke Khilari was Satyajit Ray's first Hindi film. The Master set the Premchand story against the backdrop of the First War of Independence in 1857. Bijoya Ray, his wife, reveals fascinating glimpses behind the making of the epic in this exclusive excerpt from her memoir. In June, Manik (as Satyajit Ray was called by his family and close friends) checked into Kenilworth Hotel for a few days to write the screenplay, script and dialogues of Shatranj Ke Khilari. He had been discussing the possibility of making this film for a long time, but was still in two minds about it. This was primarily because making the film in Hindi meant that he would be unable to write the dialogues, and this was something he couldn't accept. Dialogue is such a crucial part of a film, and I doubt that anyone could write better dialogues than he did. He was a bit hesitant leaving this to somebody else. Bansi (Chandragupta, Ray's art director) however, said, 'This is hardly a problem. You'll write the dialogues in Bengali and they will then be translated into Hindi -- and when you listen to them you can judge their quality because you can understand Hindi quite well.' He finally agreed with Bansi and began to write the screenplay. Bansi and (producer) Suresh Jindal came down from Bombay to finalise all the details for Shatranj Ke Khilari. Everything was settled, but initially I had no idea about Manik's own fee, or whether he had even discussed it at all. Later, Bansi gave Manik a severe talking to on the issue of money. Apparently, when Suresh Jindal had asked Manik about his own fee, he had become confused as he never discussed money matters directly with any producer. Anil Babu (Ray's production controller Anil Choudhury) was the one who dealt with the producers and settled the fees. But this time, upon being asked directly, Manik timidly quoted a sum that pleased Suresh so much that he agreed to it instantly. I never found out the exact sum Manik had asked for. However furious Bansi was, things were already settled and there was nothing else that could be done. Manik wasn't keen on further negotiations either. Excerpted from Manik And I, My Life with Satyajit Ray, by Bijoya Ray, Translated by Indrani Majumdar, Penguin India, 2012, Rs 699, with the publisher's kind permission. You can buy this book at the Rediff Bookstore and save Rs 174! On the first day of December, Suresh Jindal and Shama (Zaidi) came to our house in the evening. Shama was to help Manik with the screenplay and costumes. She was very efficient, and knew her job well. Being an aristocratic Muslim, she was well-versed in their customs and social etiquette, knowledge that was very important in the context of this film. Shooting finally began on 6 December 1976. As I had been unwell, I had to miss the first day's shooting for the first time in all these years. The medicines helped and I was ready to accompany them the very next day -- there's something exciting about this very first day of shooting. The first sequence was shot with Saeed Jaffrey and Sanjeev Kumar, both wonderful actors. As it was the first day, things were a bit delayed, and shooting began only at 5 pm. Manik and the others returned home around 8.30 in the evening. Shooting was progressing so smoothly that Suresh was keen to shoot the entire film in Calcutta. The main motive behind this was, of course, saving money -- it cost much less to shoot a film here than it would in Bombay. One can create a set in Calcutta for exactly half the amount it would cost in Bombay. Shooting began again from 11 March 1977, this time with Victor Banerjee and Amjad Khan. There's an amusing story behind Victor getting this role. He had come to meet Manik hoping to work in his films. He was good-looking and well -educated, and as it was difficult to find people with a good background, Manik took an instant liking to him. He asked him, 'Can you speak Urdu?' Victor promptly replied, 'Yes'. 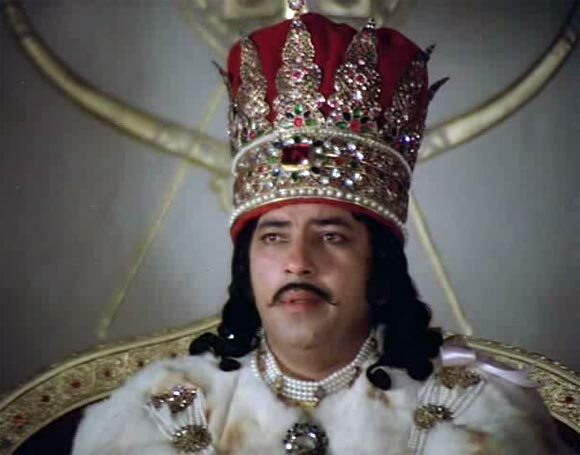 Manik was very happy, and cast him in the important role of Wajid Ali Shah's prime minister. Quite some time after shooting was over, Victor confessed that he had lied when Manik asked him if he knew Urdu -- at that time, he didn't know a word of Urdu! But from the very next day he had hired a tutor and begun learning the language. He was an intelligent boy with a flair for languages, which was why he picked it up easily and spoke it fluently in the film. He didn't want to let go of such a wonderful opportunity, and he performed very well indeed. Amjad's talent and personality overwhelmed us. Each actor was riveting, be it Sanjeev, Saeed or Amjad; and Sir Richard Attenborough, Tom Alter, Shabana Azmi, Farooq Sheikh, David, Farida Jalal all gave it their best and performed brilliantly. This was a period film, and so we required a lot of old items. I gave Manik everything in the house that could be of any use, but most of them came from his old friends, who were only too willing to lend Manik whatever he wanted. Manik was forever grateful to Mr Kejriwal for all his help -- he was the one who provided us with the old Jamawar shawls we so desperately needed. Manik had a lot of other friends who helped him -- I cannot recollect all their names. We were looking for a cat for Wajid. We couldn't find any we liked, but ultimately our old friend Jahanara Begum Choudhury helped us by lending us her beautiful cat. That cat put us in quite a spot too -- he vanished after the first day's shooting! We looked everywhere, but could not find him. Jahanara was almost in tears at the thought of losing her beloved cat. Shooting came to a halt because the cat was to keep Wajid company at all times. The next day we heard that the cat had been found. Jahanara could finally smile, and we heaved a sigh of relief. Saeed Jaffrey, who was then living in London, was asked to put forward the proposal of playing the role of General Outram to Sir Richard Attenborough. We received word that Sir Richard had agreed, and was very happy at the prospect of working with Manik. One evening in early May, Amjad came to our house for dinner. He 'was such a wonderful man. He was a teetotaler and quite surprised to see that no one in our family drank alcohol. He spoke charmingly and was very well-educated too. Manik and he found many things to discuss, and time just flew. We were busy with yet another aspect of the shooting. Sir Richard was yet to arrive, but Marie Seton had already come, bringing Sir Richard's costume with her. Manik, however, rejected the costume after one look, and everything had to be redone all over again. Sir Richard gave his first shot on 27 May. As it was the height of summer, the heat was killing; and on top of that he had to shoot in a warm costume inside a closed studio. He must have felt very uncomfortable, but not once did he complain. 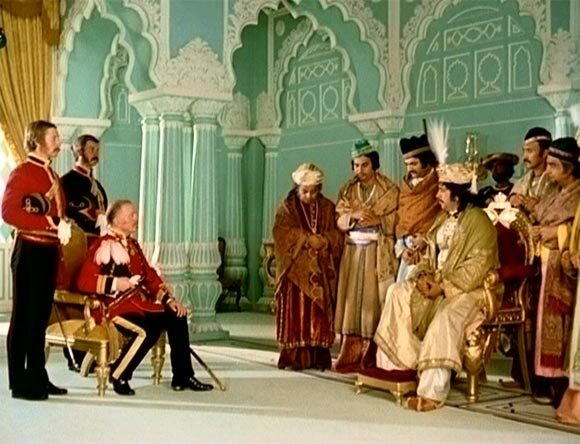 The producer of Seemabaddha, Jung Bahadur Rana, had his own air-conditioned room at the Indrapuri Studio, which he had left for Sir Richard's use. I think it must have been even worse to emerge from that cool room to shoot in the horrible heat. Watching him shoot was an exciting experience. 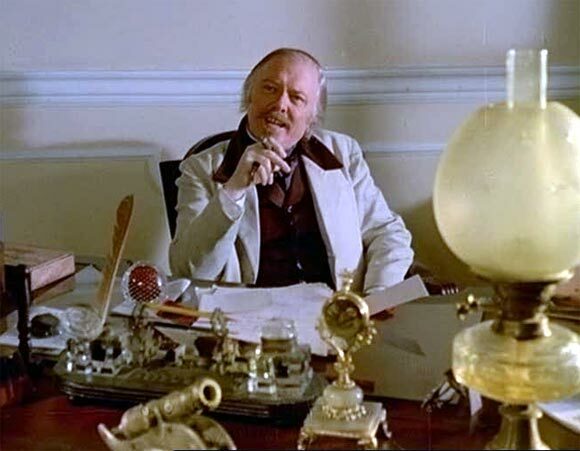 I couldn't help thinking -- here is a noted British actor working under my husband's direction, delivering dialogues written by him, and, to top it all, shooting in the unforgiving Calcutta heat in our Indrapuri Studio! Meanwhile Sir Richard, after taking Manik's permission, had begun calling him 'Manikda'. On 29 May Manik shot a thrilling sequence between Amjad and Sir Richard, and I cannot explain how wonderful it was to watch them. On the evening of 1 June, Sir Richard took our entire unit to dinner at the Grand Hotel. His manners were always so impeccable. We left for Bombay on 2 August 1977 for dubbing and re-recording, which took quite a long time to do. As always, Shashi and Jennifer (Kapoor) invited us to dinner one day. Sanjeev (Kumar) too had us over to dinner at his house, where we met his mother, brother and sister-in-law. I realised that Sanjeev loved and respected his mother a great deal. Like all mothers, Sanjeev's mother too was keen that he get married, but since things hadn't worked out with the person he wanted to marry (I won't reveal her name), the topic had been shelved for the time being. His mother was a nice, warm person, and kept asking us to persuade Sanjeev to get married. Sanjeev, of course, laughed it off. Had he married, he might have been alive today. He had bypass surgery after his mother's death, and probably didn't follow the doctor's instructions or take his medication too carefully. He died soon after the operation. It was a great tragedy to lose a man of his calibre. He was such a gentle and charming man. It took me a while to accept his death. And then we were faced with a new problem. A powerful section in Bombay was campaigning against the release of Shatranj Ke Khilari. They believed that if the film was a success, the other 'typical' Hindi films would be hit adversely, an assumption that was entirely unfounded. Suresh and Tinnu (Anand, the wellknown director who was then Satyajit Ray's assistant director) came over to tell Manik all about it. Manik was very surprised, but had nothing to say. After all, he couldn't launch a fight against the Bombay film industry! Before returning to Delhi, Suresh came to meet Manik once again and assured him that he wouldn't give up so easily. He would find some solution to the problem. 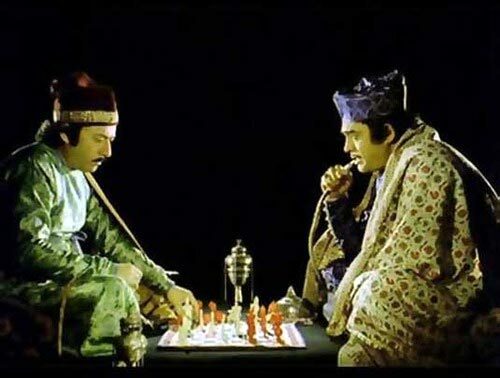 Shatranj Ke Khilari was screened at a single show in Bombay, and soon after we were deluged by telephone calls. The first call came from Ismail Merchant, who called the film 'terrific'. Abbas (Khwaja Ahmad Abbas) sent us a telegram to say that Manik's latest 'masterpiece' had overwhelmed him. The last call was from Amjad. He had liked the film so much that he had bought the distribution rights for Delhi and Punjab. Suresh informed us that Amitabh Bachchan and Vinod Khanna had loved the film. Manik went to Berlin in March 1978. But this time he returned empty-handed. Shatranj had made a huge name for itself, but the only reason it didn't win an award was that they didn't want to award the same person over and over again. He had received the best director award twice (for Mahanagar and Charulata), once for best film (Asani Sanket), and once a Jury Prize and Critics' Award (Nayak). Apart from that, he had also won the Selznick Golden Laurel thrice for Pather Panchali, Aparajito and Teen Kanya during the Berlin International Film Festival. How many more awards could they give him? PIX: Bridal inspiration for Kareena Kapoor!